It has been a long, warm summer in the UK this year. The perfect opportunity for a seaside holiday, so armed with buckets and spades we headed to Devon. 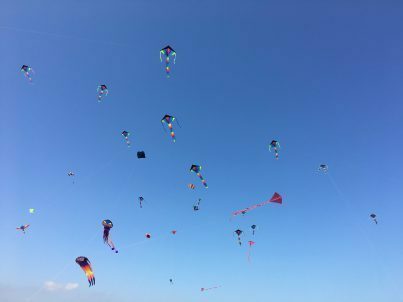 I heard about the Exmouth Kite Festival quite by chance – a conversation with someone in a lift – and was glad that I did as we had a fabulous day. Whilst my eldest son went off with the aim of winning me a bottle of champagne at the hoopla stall, I made a kite with my younger son. He chose a red tail to go on his red kite and adorned it with sparkly decorations stuck on with PVA. Perhaps you can see it in the photo. People who had made, bought or brought their own kites were invited into the arena to fly them. We watched as our little handmade kite caught the breeze and soared and swooped perfectly. With music playing and a stillness from the crowd, we were somewhat hypnotised by the simplicity and beauty of the kites in the blue sky. Thinking about it afterwards, I was struck by the number of phrases associated with flying which give us a sense of optimism and expectation. Are you like a kite? Free to fly yet grounded too? Could you look down and see your life from a different perspective? How would that be? We all took a turn at flying our kite. Sometimes, as in life, it got in a tangle, but nothing that we couldn’t sort out. Despite his best efforts my son didn’t win the bottle of champagne, but I scored a goal in the (very difficult, actually!) football game, winning £5. The ice creams were on me that day.